We know there aren’t enough hours in the day or days in the week to keep up with our constantly evolving industry. We’ve got you covered. From education courses and certification to contract documents and conferences, being a DBIA member pays dividends. Joining DBIA provides far more value than can be counted in dollars and cents. But who doesn’t like saving some cash? DBIA Events: the amount varies depending on location but DBIA Members always receive discounts at the hundreds of national, regional and local chapter events held nationwide. And there are additional DBIA member savings for groups, Owners and Young Professionals (YPs) which make your DBIA Membership a smart investment in your design-build future. All DBIA members receive the design-build industry’s must-have resource, the Design-Build Manual of Practice, at no cost. Login to your DBIA account and go to the Resources tab to access the Manual of Practice chapter downloads and your DBIA Bookstore discount codes. Design-build is all about connections, collaboration and building successful teams. DBIA’s online Member-only resources allow you unparalleled access to make those connections that count. Your online DBIA member profile raises your visibility and helps open the door to new professional relationships. Log in to your DBIA account to search our membership directory. Looking for a firm with a track record or specific expertise? DBIA’s Industry Match tool helps IP members build strong teams to deliver successful projects. The Hub is DBIA’s online community/message board. This members-only platform provides a convenient space to discuss topics, share files and more with your peers and fellow members. DBIA’s Integration Quarterly is the nation’s only magazine devoted solely to the design-build industry. Hot topics, industry trends, analysis and case studies from some of America’s leading design-build experts provide DBIA members the latest news you can use. Project Delivery is comprehensive, and choosing a project delivery method is one of the fundamental decisions owners must make while developing their acquisition strategy. Choosing the best method for any project must start with a good understanding of the available choices. Owners must also have a firm grasp of the impact of each choice, because the delivery method establishes when parties become engaged; it influences the choices of contractual relationships; and it influences ownership and impact of changes and modification of project costs. It is important to choose a delivery method that best meets the unique needs of each owner and their project. This primer introduces you to commonly used project delivery methods along with their pros and cons. Based on research, case studies and extensive industry input, DBIA has defined design-build best practices and implementing techniques that deliver successful projects, no matter the size, type or sector. Design-Build Done Right® is time-tested and proven its effectiveness by helping teams deliver some of our nation’s most impressive projects. There is a better way to build and DBIA’s many Best Practices resources help get you there. The evolution of this document is based on input from DBIA members and the A/E/C industry. The challenges facing sectors can be unique. That’s why industry leaders serving on DBIA’s market sector committees created these targeted resources to address specific issues impacting the Transportation, Water/Wastewater and Federal sectors. Start with the Universal Best Practices document and then use these targeted resources to increase your design-build knowledge. Lastly, Deeper Dive documents provide a more targeted look into specific topics important to each sector. The transportation sector has many unique features that are central to the consideration of best practices in the procurement, contracting and execution of any design-build project. This document includes modifications to the universal implementing techniques and new techniques, all of which are intended to address the real-world attributes of the transportation sector. This document, which combines Universal Best Practices with water/wastewater best practices and implementing techniques, is the basis for Design-Build Done Right® in the water/wastewater sector. It also highlights unique characteristics of water/wastewater Owners, projects, procurement and the design-build team structure. It’s vital to understand the Federal Acquisition Regulation (FAR), and what it allows and/or precludes, to deliver a successful design-build project in the federal sector. Most agencies further supplement the FAR with agency-specific policies and procedures tailored to their specific mission. This guide provides best practices, techniques and Design-Build Done Right® tools to help teams navigate federal project delivery. One application of design-build delivery is via a stepped, or progressive process (commonly referred to as Progressive Design-Build or PDB). PDB uses a qualifications-based or best value selection, followed by a process whereby the owner then “progresses” towards a design and contract price with the team (thus the term “Progressive”). This Progressive Design-Build Done Right™ document outlines the best practices for PDB delivery. This primer provides a general overview of common P3 terminology and the benefits and challenges of undertaking a P3. It is meant to serve as a starting point for the user to further investigate and make inquiries regarding the delivery model. Call them what you wish – owner’s consultant, owner representative, owner advisor, owner’s engineer, owner agent, criteria professional/consultant or A/E1 – they all serve the same purpose: to guide an owner through the process of advertising, selecting, hiring and working with the best design-build team for their project. Working from the assumption that the owner has already chosen to use design-build, this primer can help an owner select an owner’s consultant who will guide them through the process. These resources provide Guidance from DBIA’s senior staff to help you navigate complex or controversial aspects of the design-build methodology. A comprehensive reference manual for owners and practitioners, the Design-Build Manual of Practice includes narrative instructions, procedural guidance, sample formats and best practices recommendations. You’ll also find basic definitions, selection procedures, project execution checkpoints, tenets of professional ethics, risk-management guidelines, contract formats, licensure data and regulatory and legal information. The Manual of Practice is free to DBIA members. Login to your DBIA account and then download the manual from the Resources tab. DBIA contract documents help guide design-build teams throughout the entire process. From preliminary agreements to final payment, DBIA’s contracts and forms are fair basis documents which can be edited to suit specific projects and needs. See samples of some our offerings here and then go to our bookstore to purchase. Your Member Discount Code can be found in the Resources tab of your DBIA member account. DBIA conducts the most comprehensive research on the design-build methodology. Scroll down to get access to our most popular reports. An important update to the seminal 1998 CII/Penn State cost and schedule research shows design-build continues to deliver projects faster and with greater reliability in cost and schedule performance. Funded by CII/Pankow. The most detailed design-build market research in years was conducted by FMI and found design-build will account for nearly half of construction spending in the assessed sectors (highway/street, water/wastewater and nonresidential) by 2021, with a growth rate of 18% during that same window. Joint research by the Water Design-Build Council and DBIA analyzes data collected on water projects nationwide to provide historical and prospective trends for design-build contracting by geographic region and by project type including water treatment, wastewater treatment, wastewater collection, water conveyance and stormwater management. The transportation sector’s use of design-build has outpaced every other market sector — and it’s still growing. In December 2015, DBIA surveyed DOT Owners to find out how many design-build projects their department had completed, and the results show a more than 600% increase since FHWA’s survey in 2002. This study is based on the presumption that design and construction is an imperfect process with a variety of inherent uncertainties. The study aimed to help project teams identify, anticipate and mitigate the conditions and factors driving that uncertainty, so that Owners might adjust their expectations of project team performance accordingly. Research reveals that while Owners, architects and contractors in the buildings sector all agree that the choice of a delivery system impacts project cost, schedule, and client satisfaction, perspectives on which of the three established delivery systems can best deliver these and other benefits often vary widely by player. The results of a study conducted by RSMeans on the growing use of design-build indicate that for the first time more than half of projects above $10 million are being completed through design-build project delivery. The study also confirms that the use of design-build has remained steady since its growth spurt at the end of the last decade, and also that Oregon and the Military sector lead the nation in design-build expenditures. This report illustrates how project-delivery methods help achieve sustainable, high-performance building projects. The findings are synthesized from a two-year study that collected data through 230 surveys, 92 procurement documents and 12 in-depth case studies. Mortenson Construction surveyed design-build industry leaders at the 2010 Design-Build Conference and Expo and compiled their responses regarding the state of the industry. Researchers sought to determine the effect of delivery methods and practices on the level of integration achieved in projects, and the repercussions of integration levels on the outcomes of projects emphasizing sustainability goals. The report supplements and validates research that produced the previous report. It consists of 12 in-depth case studies of the project delivery phase and compared them with building performance at project completion. This study of delivery systems found that design-build offers equal or higher quality than other commonly used delivery methods. The main findings are that, compared to the traditionally used design-bid-build, design-build delivers projects with an average 6% cost savings, 12% faster construction speed, and 33% faster overall project delivery. In fact, design-build outperformed design-bid-build in every category on a 10 point scale. CareerSpot is the Design-Build Institute of America’s interactive career board. As the center of expertise in design-build project delivery, DBIA is uniquely positioned to connect employers and career seekers who share an interest, passion and commitment to integrated project delivery and the design and construction industry. Post a job, search resumes and find the right person for the job. Post your resume, search job openings and find your dream job. Posting a resume is free! You can also find job listings by joining our LinkedIn group. DBIA provides the design-build industry a unique opportunity to showcase successful design-build projects. Add your project details and photos to show off your good work and share insights into the successes driving the design-build movement nationwide. Owners and practitioners alike can use the DBIA database to see the latest design-build projects across all sectors, sizes and types. Once completed, your information can also be used to build the foundation for an entry into our annual Design-Build Awards Competition. DBIA’s newly revamped blog is the most timely way to keep in touch with our industry real-time with regular news updates and insightful analysis on the issues more important to design-build practitioners and Owners. Get the latest here. 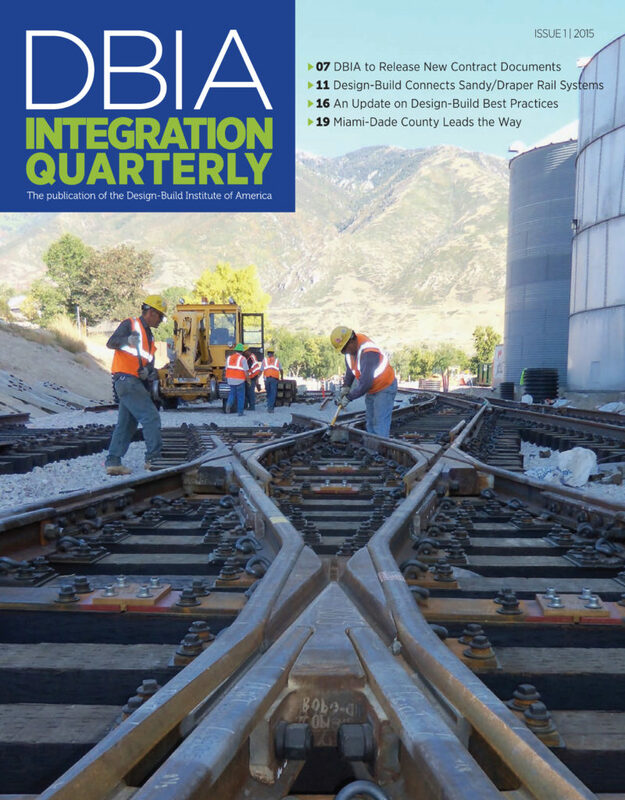 DBIA’s Integration Quarterly (IQ) magazine provides a diverse collection of articles including; legislative updates, industry trend articles, thought leadership, features on design-build best practices, projects and opinion pieces. Individual copies of back issues are available for $20 each for DBIA members, $25 for non-members. Contact Kim Wright to order: kwright@dbia.org. To advertise in IQ magazine, please email the PAI Sales team or call (202) 454-7535. DBIA also produces a weekly e-newsletter for our members, Design-Build Insight. The e-newsletter includes the latest industry news, updates from DBIA, a calendar of upcoming events and news from DBIA members. Easy access to live and on-demand webinars and hundreds of hours of recorded conference sessions — all at a discounted price! DBIA’s webinar subscription service provides easy access to online education offerings through our Design-Build Done Right® Webinar Series and to more than 200 archived conference recordings. The subscription service is especially beneficial to DBIA certification credential holders and/or certification candidates who won’t need to order required professional development one webinar at a time. This one-year subscription service is offered at a 50 percent discount from the regular rate and will begin from the date of purchase. Annual subscriptions begin at $625.00. This discount represents a significant 50 percent savings from the individual webinar pricing. Note: Individuals must register to receive credit. If one individual registers for three (3) different sessions, either live or archived, three (3) sessions will be deducted from the allotment. If a team of five (5) people is planning to view a webinar (one location or multiple), all five (5) must be registered to receive credit and five (5) sessions will also be counted against the available allotment. Not a member yet? Get access to the full range of DBIA's resources and other benefits by joining today.